Over the past five years, Ghana’s government has intensified its efforts to safeguard against illicit financial flows, money laundering, corruption, financing of terrorism and organized crime. It has been supported by civil society groups and driven by international commitments. Ghana has made progress largely under the direction and support of intergovernmental organizations. Ghana had failed to meet key performance targets set by the Inter-Governmental Action Group against Money Laundering in West Africa (GIABA), a specialized institution of the Economic Community of West African States. One such missed benchmark was the 2012 GIABA deadline for the establishment of a regime for the disclosure of the identities of the “beneficial owners” of companies in the subregion. Until August 2016, none of the country’s laws provided for disclosure of beneficial ownership, making it easier for companies to obscure or hide their true owners. Following the leak of the Panama Papers, the push for beneficial ownership disclosure gained momentum in Ghana partly owing to concerns exacerbated around the lack of transparency in petroleum agreements and rumors about the role of politicians in illegal mining. But methodical, painstaking advocacy was needed to ensure action. NRGI organized the first beneficial ownership workshop for the Ghana Extractive Industries Transparency Initiative (GHEITI) multi-stakeholder group members in June 2015. 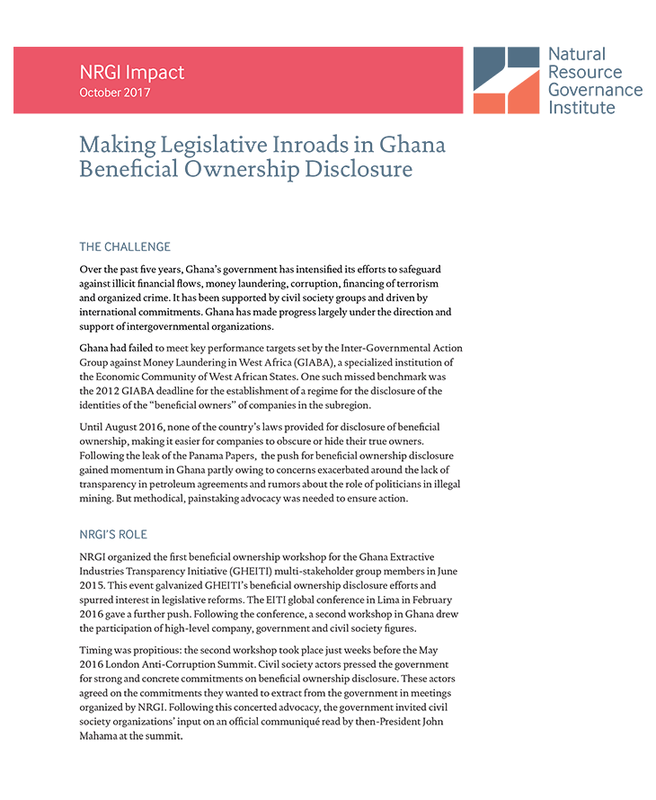 This event galvanized GHEITI’s beneficial ownership disclosure efforts and spurred interest in legislative reforms. The EITI global conference in Lima in February 2016 gave a further push. Following the conference, a second workshop in Ghana drew the participation of high-level company, government and civil society figures. Timing was propitious: the second workshop took place just weeks before the May 2016 London Anti-Corruption Summit. Civil society actors pressed the government for strong and concrete commitments on beneficial ownership disclosure. These actors agreed on the commitments they wanted to extract from the government in meetings organized by NRGI. Following this concerted advocacy, the government invited civil society organizations’ input on an official communiqué read by then-President John Mahama at the summit. To keep the momentum going and ensure real action, NRGI and GHEITI organized a high-level multi-stakeholder forum in June 2016. In attendance were the majority and minority leaders of parliament, the registrar-general, NRGI president and CEO Daniel Kaufmann and civil society experts. Civil society organizations including the Africa Centre for Energy Policy, PWYP Ghana, the Integrated Social Development Centre and the Financial Intelligence Centre reconvened after the forum to continue monitoring the government’s commitment. NRGI also engaged with the government to ensure civil society representation on the legislative reform committee. Ghana’s beneficial ownership reforms have made swift progress thanks to a locally driven approach with NRGI financial and technical support. As a result of consultations, a consensus emerged that the scope of beneficial ownership disclosure should be expanded beyond extractives and apply to all companies registered in Ghana. At the time, the Companies Act was under review and consideration by parliament, providing a good opportunity to make improvements to the bill via amendment—versus waiting years for an entirely new bill to be passed. Parliament amended the act in August 2016, paving the way for implementation of a beneficial ownership disclosure regime in Ghana. The law now mandates that the registrar-general maintain a beneficial ownership register. (This register is yet to be developed. Ghana’s Registrar General Department has indicated this may begin in 2018.) NRGI inputs improved the original draft of the provision and widened the scope and de nition of beneficial ownership to include politically exposed persons. The legislation doesn’t just impact extractives. By providing for ownership disclosure for all registered companies, areas such as public procurement and contract allocation experienced an increase in transparency. In February 2016, Ghana’s president-elect, Nana Akufo-Addo, forcefully declared his support for beneficial ownership disclosure. “It was necessary for lifting the veil from public officials who hide behind cronies to amass wealth through shady public procurements,” Akufo-Addo told Ghana’s Public Agenda newspaper. It was a signal he could continue to support transparency progress. Looking ahead, Ghana must develop an implementation framework with clear timelines to ensure that reforms stay on course. Local partners supported by NRGI continue their important work in this regard.